Storm Damage: What Is A Deductible Expense? 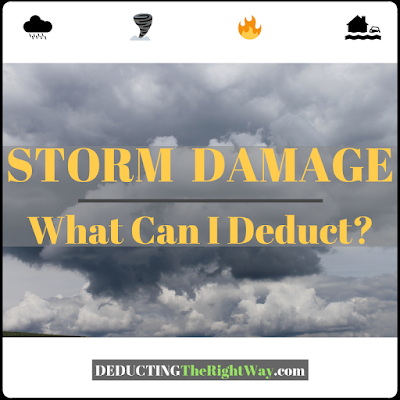 If you suffer damage to your personal property during a storm or other natural disaster, then you may deduct the expenses incurred to repair or replace those items. It's also known as a casualty loss deduction. A casualty can happen to you — a hurricane, tropical storm, snowstorm, windstorm, tornado, volcano, flood, fire or earthquake. If it does, you may be entitled to a deduction for the money you pay to fix your property or buy a new item. What is personal property? It can include your automobile, RV, boat, primary home, second home, personal belongings, and more. Where does the property need to be located? The home must be situated in a federally declared disaster zone. However, other exceptions may apply. To find out if your area is in the qualifying district, visit FEMA. How much can I deduct? If your home insurance policy takes care of everything for you, then you cannot claim a deduction. However, if you come out of pocket to make yourself whole again, then you are one step closer to an eligible deduction. Which IRS form do I use? Refer to Form 4684 and the form's instructions. You can also get pointers from the IRS article Top 10 Tips for Deducting Losses After a Disaster. You must follow specific guidelines to claim a casualty loss on your tax return. If you do not adhere to the IRS rules and you undergo an audit, then the figure could be reversed on your tax return. In that event, you could owe penalties and interest plus the unpaid tax you should have paid if you had not lowered your income with the disallowed deduction. You must follow specific guidelines to claim a casualty loss on your tax return. Check out our other article 3 Urgent Steps You Need To Complete After the Storm. \nA casualty can happen to you — a hurricane, tropical storm, snowstorm, windstorm, tornado, volcano, flood, fire or earthquake. If it does, you may be entitled to a deduction for the money you pay to fix your property or buy a new item. \nYou must follow specific guidelines to claim a casualty loss on your tax return. If you do not adhere to the IRS rules and you undergo an audit, then the figure could be reversed on your tax return. In that event, you could owe penalties and interest plus the unpaid tax you should have paid if you had not lowered your income with the disallowed deduction. \nYou must follow specific guidelines to claim a casualty loss on your tax return. \nCheck out our other article 3 Urgent Steps You Need To Complete After the Storm.